So many of us in one way or another have struggled to have a well defined twist out. A twist out hairstyle is one of the most popular hairstyles among naturals. It is a great natural hairstyle to help stretch out hair. You can also leave them in twists as a protective hairstyle. 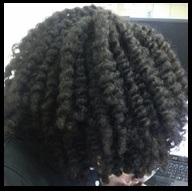 A twist out is two sections of hair that are used to make a twist from the roots of your hair to the ends of your hair. Then after your hair has set (mostly overnight without heat or under a hooded dryer) the twists are untwisted to form a wavy and coily pattern. There are a lot of tips to help you have a great twist out no matter what your hair type and length is. Here are my top 10 tips that produce shiny, moisturized, and well defined twist outs. Twist On Clean Hair: Make sure you start twisting on clean and detangled hair. If your hair has lots of build up, the twists are not going to form or lock well to give you that defined look and last longer. Twist On Slightly Damp Hair: The moisture in your hair is what helps to lock in the twist together and help the twist out to last longer. Use A Buttery,Creamy Moisturizer OR Leave-in Conditioner: This is what makes your hair look and feel soft & moisturized and also prevent flaky,dry hair when you use a gel. Optional – Use A Strong Holding Gel: This gives your twist a strong hold. Avoid gels with alcohol because they will dry your hair and make it frizzy. Avoid Product Overload On Your Hair: Too many products on your hair will cause build up and that will lead to your hair not holding the twist. Tight Twists: Make sure your twists are not too loose. Also don’t make them too tight because this will cause your hair to break. Protect Your Ends: Use a product like shea butter OR oils on your ends to avoid the ends from frizzing out and keeping the shape of the twist out. Optional – Retwist Your Hair Every Night: If your hair feels dry each night, you can use a light spritz (water & oil) OR a moisturizer. Also adding a little gel helps to hold the twist longer. Tie Your Hair Every Night: Wrap your hair with a silk scarf or sleep on a silk pillowcase. This will prevent your hair from being frizzy, keeps moisture in your hair and your hair will turn out smooth and shiny the next day. Keep your hands off your hair: It reduces frizzes and helps hair to keep its shape. What other tips do you have for having a great twist out? Let me know in the comments below.